Treat yourself to a truly special one of a kind bracelet. This Burma Jade will be sure to take your breathe away! Jade is a symbol of purity and serenity. Increases love and nurturing. Believed to attract good luck and friendship. A protective stone which keeps the wearer from harm and brings harmony. Jade is a symbol of purity and serenity. Much prized in the East, it signifies wisdom gathered in tranquility. Jade is associated with the heart chakra (chakra 4 - Anahata) and increases love and nurturing. It is a protective stone, which keeps the wearer from harm and brings harmony. It is believed to attract good luck and friendship. Psychologically, Jade stabilizes the personality and integrates the mind with the body. It promotes self-sufficiency. 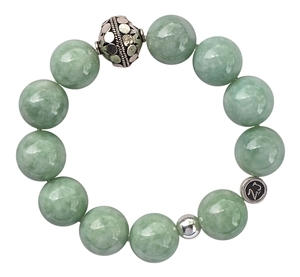 Mentally, Jade releases negative thoughts and soothes the mind. It stimulates ideas and makes tasks seem less complex so that they can be acted upon immediately. Emotionally, Jade is a "dream stone." Placed on the forehead, it brings insightful dreams. It aids emotional release, especially of irritability. Spiritually, Jade encourages you to become who you really are. It assists in recognizing yourself as a spiritual being on a human journey and awakens hidden knowledge. Add a little peace and harmony to your life from the energy of our high quality Burma Jade bracelet! Jade has been known to treat the kidneys and supra-adrenal glands as it removes toxins, rebinds cellular and skeletal systems and heals stitches. It has been used to aid pregnancy, conception, fertility and assist in childbirth. It can work on the hips and spleen. Jade balances fluids within the body and the water-salt/acid-alkaline ratios. Jade is a cleansing stone, aiding in the body's filtration and elimination organs. It is the gemstone known as par excellence for the kidneys.